Oprah Winfrey is Mrs. Which and Storm Reid is Meg Murry in Disney’s A WRINKLE IN TIME. ©Disney Enterprises. CR: Atsushi Nishijima. HOLLYWOOD—No one is as beloved in popular culture right now as entertainer, media mogul and philanthropist Oprah Winfrey. So popular is the former talk show hostess that a grassroots campaign arose a few weeks ago to draft her to run for President in 2020. Winfrey, 64, dismissed that possibility, saying she’s not interested in running for the nation’s highest political office. For now. 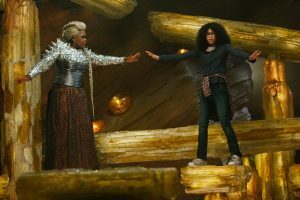 In the meantime, the Mississippi native has a new movie to promote—the big screen adaptation of Madeleine L’Engle’s classic—and controversial—children’s book “A Wrinkle in Time.” (It was banned in some school districts for its mention of Jesus Christ and other religious figures in history.) Winfrey plays—what else—a giant magical woman named Mrs. Which, who, along with two other magical women, lead a teenage girl and her young brother to a mysterious place on the other side of the universe to find their missing scientist father. The fantasy adventure, adapted for the screen by “Frozen” scribe Jennifer Lee and directed by “Selma” filmmaker Ava DuVernay, is about love, forgiveness and the unbreakable bonds of family. At the center of the story is a 13-year-old girl—Meg Murry (played by Storm Reid)—who is bullied at school because, among other things, her father disappeared without a trace four years earlier. When she arrives home, her younger adopted brother Charles Wallace (scene-stealer Deric McCabe) has invited a strange woman into the house identifying herself as Mrs. Whatsit (a red-haired Reese Witherspoon). Soon, the kids are introduced to Mrs. Who (“The Mindy Project’s” Mindy Kaling, who quotes great philosophers, but not Jesus) and Mrs. Which (Winfrey, a towering figure in a glittering silver gown, blond wig, shimmering makeup and gleaming jewels). The group is soon off on a journey to a planet across the universe to find the children’s parent (“Star Trek’s” Chris Pine). Of course, the rescue isn’t easy as the kids and their guides have to avoid “It,” an ominous evil force lurking throughout their quest. Meg is determined to save her father, even if it means risking her own life. The visual effects-laden adventure also stars Zach Galifianakis, Gugu Mbatha-Raw, Rowan Blanchard and Levi Miller. Q: Did you feel this character was tailored to you? Q: You never read the book? Winfrey: I’ve never read the book and, you know I’m a reader. But it never got to my neighborhood. Q: It was banned. Maybe that’s why. Q: You did some wire work, right? Winfrey: The first day on the wires, I went, this is really some kind of movie. What kind of movie is this that she had just came up out of the imagination. It has been, the word “delight,” when you look up the word “delight,” there’s my picture. For being in this film, the whole process, has just been one big delight. Q: What’s different about this project as opposed to some of the other ones that you and Ava have collaborated on? Not just the script obviously and the cast, but in terms of the process with working and how you arrived to this point? Winfrey: Well, first of all, you have Disney money. (She laughs.) What’s different is (when we were filming) “Selma,” at the end, we were like, “Are we’re going to have enough money? How much do I have? Let me try to help you out here.” (With “A Wrinkle in Time”), you’ve got the Disney machine and that’s why one of the reasons why this is so exciting, that Ava DuVernay is at the helm of (a big studio movie). I’ve said this before. It makes me well up inside. It fills my heart, every time I think about Ava and her (dreadlocked hair) and her sneakers and these big cranes and all of these men running around, taking direction from her. To see her be the master of that, to orchestrate all of that was powerful and inspiring. It touches the part of us that recognizes, “Oh yeah, we can do that, we’ve always been able to do that.” I was just so proud to be associated with her and her ability to make this film possible. So that’s what was different. I was with her on a film where literally we had one day to shoot everybody coming across the bridge in “Selma.” (We had) to get it before it rains, and if it rains, we’re not going to get (the shot). We didn’t have enough money to try it again. So, it was a big difference. Q: You say in the movie that we need to restore hope. What do you think it’s possible to be hopeful in times like these? Winfrey: Oh yeah, for sure. I think the Darkness is there to help bring out the light in all of us. And if you think about it, if we turned all the lights off in this room, and you just held one person just held a candle, you would start to dissipate the Darkness. You would banish the Darkness. And look at how much Darkness it would take to actually engulf all the light that every candle would hold in this room. It just takes a little bit of light. That’s what we’re hoping for— a little bit of light. And if everybody can get that message, that’s how we have hope in the world. We’re looking for warriors who can bring hope back.